News this week out of Japan that workers at the crippled Fukushima Daiichi nuclear plant have detected extremely high levels of radiation in and around reactor 1. The first incident, on August 1, pinned the Geiger counter at 10 sieverts (1000 rem)—yes, that’s as high as the device could measure, so that number is a minimum—and was taken at the base of a ventilation stack. The second reading, the following day, clocked in at five sieverts per hour inside the reactor building. I have yet to read an explanation for the discovery of the second reading, but the initial, sky-high measurement on Monday has me and many others scratching heads. A thousand rem is not some little ho-hum number. A half-hour of exposure at that level is fatal in a matter of days, I am told. Where did that radiation come from? When did contamination occur? How is it that such a dangerous level could go unreported for what is now over 140 days? Officials from the Japanese power company, TEPCO, who have been repeatedly criticized for withholding critical information, insist that contamination likely happened in the first few days of the disaster when workers tried to vent hydrogen from the reactor building in a futile attempt to prevent an explosion. Somehow, though, this part of the facility (which, it should be noted, has been extensively mapped for radioactive hotspots over the last several months) was not measured till August. Others, such as Arnie Gundersen, chief engineer at Fairwinds Associates, believes levels this high would not have gone undetected this long, and that these new readings represent a recent accumulation. 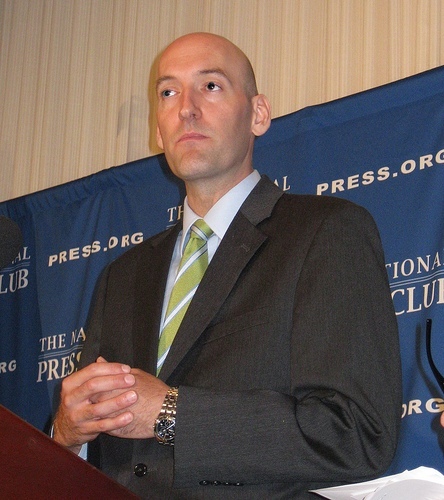 Because the measurement was taken at the base of a ventilation stack that has continued to vent undisclosed amounts from the damaged reactors, Gundersen believes that condensation and radioactive cesium trickled down to the base of the stack—which means that some amount of radioactive isotopes continues to be vented into the atmosphere. And it seems, some not inconsequential amount. Back in April, TEPCO was ordered to give an accounting of the amounts of radiation released during the crisis, and TEPCO promised to do so by August. It is now August, but there is no sign yet of this report or an indication of when it will be released. And, just to wrap up newish news from Japan, the government has announced plans to build a wall around Daiichi reaching 60 feet below ground to try to stop contaminated groundwater from reaching the sea. Beef contaminated with radioactive cesium from the plant has turned up in more markets across Japan, and the government has banned the sale of most beef from the north. Japanese Prime Minister Naoto Kan has fired three government officials with ties to the crisis, including the leader of the Nuclear and Industrial Safety Agency, which would be roughly the Japanese equivalent of the US NRC. Officially, the reason is because the agency did a lousy job of preparing for a tsunami and its disastrous effects, but it also recently came to light that this official had planted pro-nuclear-industry shills at town hall meetings in an attempt to steer public opinion. Back in the United States, one can only imagine what that kind of accountability would look like—but why imagine, when we have the videotape! This was the hearing on the report I discussed three weeks ago, and besides the obvious observation that there’s 150 minutes of life I’ll never get back, there were a few points worth mentioning. First, it was clear from the opening statements that no Senator (perhaps with the exception of Bernie Sanders. . . perhaps) was going to come close to making a call for a shift away from nuclear power in the US the way leaders in Germany and Japan have in the wake of the Fukushima disaster. In fact, the tone was very much about moving forward with some version of a flourishing nuclear industry. For Republicans on the panel, the response was predictable. The only thing that is keeping us from rushing headlong into a glorious future with upwards of 100 fabulous, new nuclear plants is excessive government regulation. In fact, Senators Lamar Alexander and Jeff Sessions seemed stunned that the Nuclear Regulatory Commission had the primary responsibility of protecting the health and safety of the public rather than helping to foster an environment favorable to the expansion of the nuclear industry. (A funny protest, really, considering that the NRC has long been criticized for acting as a booster club for the industry it is supposed to regulate—and especially risible in light of this summer’s AP exposé on the cozy relationship between power companies and regulators.) The GOP contingent chastised NRC members for thinking of themselves as guardians of public safety without regard to what it would cost what they always euphemistically referred to as “stakeholders” (as did the more overtly pro-industry commissioners). This, in turn, earned the senators a chastisement of their own from EPW chair, Sen. Barbara Boxer, who literally threw the book at them. . . ok, she didn’t throw the book, she just read from the law that empowers the NRC. Indeed, Boxer had a more refreshing take on government regulation. The California Democrat said that if the industry wanted to operate and expand, it had to demonstrate that it could do so safely. Boxer stressed that it was important that citizens saw regulators as their defenders, able to act quickly in response to a crisis and honestly assure the safety of nuclear facilities. It takes a trusted regulatory regime for an industry to prosper. That is a fair point, and one that applies to a much broader discourse about government regulation. Alas, in this case, it papers over a slow, lax regulatory history and a nuclear industry that has done a solid job of dumping campaign cash into the coffers of most of the politicians responsible for oversight. And, of course, Alexander has no room in his worldview for the 430 infants (PDF) (the most conservative estimate) that died from radiation released during the Three Mile Island disaster. Jeff Sessions is a circus sideshow all by himself (an imperious, ignorant sideshow). He used most of his time to criticize Gregory Jaczko, Chair of the Nuclear Regulatory Commission, for assuming emergency powers in the days after the earthquake and tsunami that crippled Fukushima Daiichi. In essence, Sessions was upset that Jaczko empanelled the task force quickly, rather than allow the process to be sabotaged by commissioners more friendly with those aforementioned stakeholders. The senator also tossed out that nuclear was a clean, safe and cheap domestic source of energy. None of those things are true, of course. Mining and refining the fissile materials for the reactors is polluting and comes with a large carbon footprint. We still have no clear plan to deal with “spent” fuel. Fukushima, TMI, Chernobyl, and dozens of less famous disasters belie the “safe” assumption. As far as “cheap,” when you add in the government subsidies, loan guarantees, tax breaks, security costs, and the need for a fuel -disposal infrastructure, nuclear power is not just not “cheap,” it is one of the most expensive options out there. And, as for “domestic,” as I have detailed before, we import most of our uranium—and not always from the nicest people. Alas, no one had the inclination in this Senate session to respond with any of that to Sen. Sessions. The real problems facing our nuclear future were not really on the table this week. 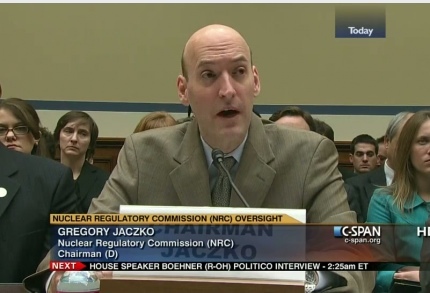 What the two-and-a-half hour hearing really boiled down to, really hinged on, was that NRC Chair Jaczko believes that 90 days is plenty of time for disposal of the recommendations (that’s how he put it—we are not talking implementation here, just the decision that the task force recommendations should be turned into rules. . . which would then take about five years to enact), but three of the five-member NRC do not. Those commissioners and their Republican brethren on the committee steadfastly refused to commit to any timeframe on anything, insisting that they needed first to hear from “stakeholders” (yes, that word again). But I feel funny rallying around this flag. As I mentioned when the Near-Term Task Force report came out, there is nothing I can see particularly wrong with any of the recommendations, as far as they go, but they fail to address any of the bigger issues, from used fuel disposal to the decommissioning of old, poorly designed, geographically vulnerable facilities. Yes, the NRC should prove that it can act—authoritatively and quickly—in the wake of a disaster. And, the federal government should prove it can rise above campaign considerations to exercise real oversight. But until people like the Senators on the EPW committee, or members of the House Energy and Commerce Committee, or the president, face up to the dangers of nuclear power revealed (again) by the Japanese disaster, or confront the myths of an energy source once called “clean, safe, too cheap to meter,” then hearings like this will feel more like redecorating than real policy.